L - Poured was golden with a full two finger head. T - Like the smell, pineapple, grapefruit, citrus. slightly sweet malt. all subtle. M - Lighter body with some moderate carbonation. O - Lighter then a traditional IPA. Is throwback a different way to say session IPA? Regardless its pretty good. do we really need another average session beer? i think not, also, an interestingly timed release for something designed for summer crushing, but yet here we have it. at least oskar blues put a new beer out finally, i have to take it. the beer is blonde and pale, short lived three quarters of an inch of white fizz on top. my girlfriend thought it smelled like a bud light, and while i do get a little corn chip action on the nose, i dont all the way agree. i think the hops selected, mosaic i think, are nice and forward and clean, which is what the style likes. the flavor is a lot like the nose, but i wanted this to be hoppier. its not all that flavorful. my other critique is that the body isnt all that light either, like, i might get full drinking a sixer of these, which i think is something to be avoided in the style. carbonation is fine, and i suppose the beer is fine on the whole too, but i would never choose this out of the growling catalog of session beers that are out there for sale in this market or any other. Solid. Drinkable. I'm no hop head, but I find this enjoyable. I could easily have another 2 of these. I haven't been a huge fan of the Oskar Blues beers, so maybe they are getting on the right track. Start with the cheeky text of on the can: "Can I Be Blunt? Pack it in. Pack it out. Sip, Sip, Give." Get it? Pours a bright, pale yellow with a clingy white foam head. Soft pine, grapefruit and grass in the nose. The body is firm, crisp, and creamy. Crackery malts. Muted grapefruit and citrus rind bitterness up front, fading into grassy and floral with an oily and resiny back end and lightly sour finish. Very more-ish and poundable. This is one pinner that we wouldn't share. 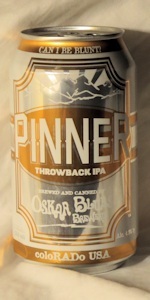 Oskar Blues "Pinner Throwback IPA"
12 oz. can, "CANNED ON 03/06/[email protected]:18 XRAY SHUFFLE"
I haven't really liked a "session" IPA until now... Right now, just at this very moment, as I sit here writing this review, I can now say I really like a session IPA. Oh, I've had one's that I've liked, that have been OK... but I've only had about 2 ounces of this - I still have at least 10 oz. of Oskar Blues "Pinner" left in my glass - and I can immediately say that I love it! It hits you in the nose and then in the mouth with pineapple, mango, apricot, papaya, lime, and just a hint of grapefruit - all refreshing bright fruits. At first I thought I smelled pine in the nose and that's why it was called "Pinner", but it's not really pine-like in the flavor at all (there's a very slight bit). Could there be more malt? I really don't think so. There's enough, and any more would start to take it beyond "throwback" or "session" IPA. More importantly it's not that bitter. Hell, it's got less IBUs than many pale ales, and yet it's so 'juicy hoppy'. It's a tropical delight! The delicate but firm, bready malt and some unusual character round it out and ground it (I don't know, Zach136 pointed it out as "onion" and I totally get that but I don't know what to call it otherwise and I have no idea where it came from), but other than that it's just a stiff spine of bitterness that flies the bright green and orange flag of some unknown tropical-fruit hop nation. I've said in the past that there's a time and place for every beer, and that when my deep sea fishing vessel catches fire and burns down to just a fiberglass hull separating me from the big fish with teeth I'd go for a mass-produced light beer - no longer... I want one of these! The can says Throwback IPA. After drinking about half a pint, I can feel that a little. The beer pours a copper color with high levels of carbonation. He bubbles are really rolling on this sucker, and there is a nice rocky head that forms on pour. The aroma takes me back to the IPAs of ten years ago - Piney, Rainey, with hints of grapefruit in the background. It’s a mild aroma, but spot on classic American IPA. Taste is combination of piney and grapefruit resin hops, with an assertive yet appropriate level of bitter. Malt is a nice biscuit backbone. This beer reminds me of a paler, less intense Sierra Nevada Celebration. This is a nice drinkable IPA. I went into the U.S. Navy back in 1983 on a drug waiver and I am glad that I did because it means that I CAN openly cop to a lot of stuff and profess knowledge that I might not otherwise be allowed to without fear of repercussion(s). This is one such instance. A "pinner" is a thin, tightly rolled joint that is more paper than marijuana and looked at lenghthwise, it has the thickness of a pin. It is the opposite of a "fatty". There was a guy in our neighborhood named Dave Pickel who was famous for his "Pickel Pins", forget a Heinz Pickle Pin. Welcome to The CANQuest (tm), where all CANs are equal and anything is fair game! From the CAN: "CAN I be blunt? "; "Sip, sip, give"; "Pack it in, pack it out"; "CANs infinitely recyclable"; "Throwback IPA". If it were truly a "throwback", it would come with instructions, ala the first Kroger CANs or Hardywood Cream Ale. Instructions on what? How to turn the empty CAN into a one-hit bowl by punching two additional holes - one for a wire screen and one for a carb! The Feds would probably s**t themselves if such was ever submitted as a label design, but man, that would be righteous. Let me know the next time I see you and I CAN show you how it is done. This was a classic Crack! & Glug and produced a finger of fizzy, bone-white head that quickly fell to wisps. Color was a pretty Golden-Amber (SRM = > 5, < 7) with NE-plus quality clarity and instantly, I was joined by the Gelt Brothers - Midas, Mammon and Croesus. Nose had a dank grassiness that made me wonder if I hadn't spilled my dime bag somewhere nearby. Nope, safe and sound! Mouthfeel was a bit thin for the style. Once again, the taste did not match the nose, which is my big hangup with the session Pale Ales. It was weak, more tea-like than hops or ganja. I took a deep breath and exhalled, hoping to get a good rush on the finish, but to no avail. Sad face. 8=( All is not lost, however, as I am loading the bhong, er, water pipe even as I toke, I mean, type and I will wash down my next hit with some Pinner. I hope everything is cool and mellow for yinz, also. Can to glass. Nose is tropical: citrus, pineapple, mango. Taste is Biscuity, with more sour fruit late, like grapefruit. Appearanxe: Bright golden color. Half inch white head. Fades pretty quick. Feel is just right for a session beer like this. Above average carbonation. Fairly thin, but not without some body....easy drinking. Another winner from oskar blues who has helped me cure my discrimination against canned beer. Found this in a tallboy over in Plattsburgh, NY the other day. You can get it in sixers but not in a tallboy here. Pours a bright golden color with a frothy head that fades to lacing. Looks lively as far as carbonation is concerned. Tropical citrus with a touch of biscuit malt in the nose. Spot on as far as the description is concerned. Juicy with grapefruit peel and mango, followed by that wonderful biscuit malt at the back. Flavorful for something that's only 4.9%. Finishes clean at the back of the throat with some lingering citrus. Amazingly flavorful session IPA. I highly recommend that you pick up a can (or six) today! Loads of citrus fruit, a little tropical, and dank. Tangerines, grapefruit, mango, pineapple, a bit peppery. One of my favorite hop profiles. Malts are cracker like. Solid session. tasted like a watered down ipa, would have been better as a pale ale. Vigorous pour yields a one inch white head over a bright, light yellow body with some lacing. Nose of light pine, slight citrus, and even slighter tropical fruit. Very nice and light, and very refreshing on the palate, Good feel and overall a great session beer. Cheers! Wonderful beer to down right after getting home from work or while mowing the lawn, and just about anytime you want a refreshing beer to drink quickly. It has a solid enough cracker-like malt base and some spicy, citric and lightly bittering hops to make for a tasty offering. I can see myself drinking this again and again. Low carbonation, light in color. Aroma is light, fruity hops, with a touch of honey. Nice hoppy flavor, not too bitter, which is expected for a session IPA. Slightly viscous mouthfeel with a dry finish. I enjoy this beer. It may be every bit as good as All Day IPA, but I’ll have to try them side by side to picke a winner. Pours golden with a lasting white head. Lacing sticks. The smell is of pine/resin, citrus - full of aromatic hop goodness. The taste is of bitter citrus and pine. A bready/grainy malt backing is subtle, but enough to keep it smooth and to add balance. Anyway, for a "session" IPA it is great. Plenty of aromatic hops. can picked up locally, dated 2/27/15 (just over a month), enjoyed from an oskar blues rocks glass. a - pours transparent yellow orange thin fizzy head that didn't hang. streaky lace. s - nose is light citric hop on the tropical side of the spectrum. really nice. t/m/o - many folks have commented that this is a watered down ipa, and I think that is just a symptom of the style...but this is one of the better low abv ipas I have tried. light and soft, real nice flavor, but yes a session ipa and the body leaves something to be desired but nice hop flavoring if you are looking to throw back many in a sunny day. O: The official beer of Pinterest? In past reviews, I have repeatedly admitted that I like session IPAs. That being said, this is not the best representation of this pseudo-style. The hops are weird, with an odd blend of citrus and herbal spiciness. Once my taste buds decided this tasted like black pepper, I can't stop thinking about its peppery qualities. It's great with food, but alone, it's a mostly average session IPA. It's definitely not much of an IPA, but I can forgive that. COD 3/10/15. Pours a clear copper gold. World class head volume, lacing and retention. Wonderful outstanding nose of grapefruit, mango, passion fruit and a hint of herbal hops with a very light touch of peppercorn over biscuit. Not quite intense enough to warrant world class, but the complexity and balance are there for same. Light medium body with a smooth texture and a touch oiliness. Normal carbonation with a bit of effervescence in the finish. The very good flavor profile doesn't produce the promise of the nose. Hop flavors lead in a blended fashion but only separate into grapefruit rind and an herbal blend...missing are the rich tropicals of the nose. The middle is mildly bitter with a pith quality. A strong biscuit background also emerges in the middle and lends a balance but never achieves sweetness. The finish is a slow fade of rind bitterness.